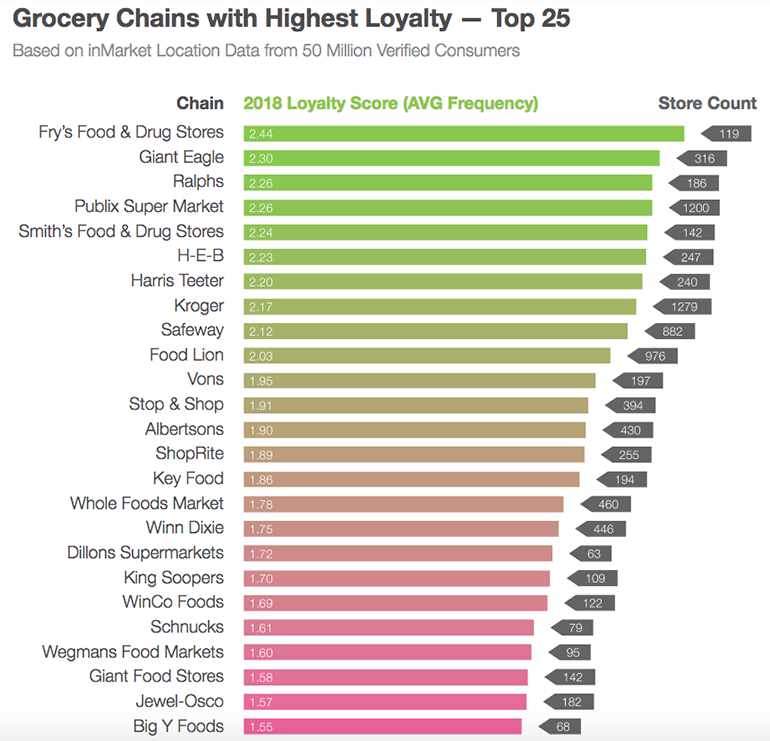 Fry’s Food Stores finished first in a list of the top 25 supermarket chains by customer loyalty from digital advertising specialist inMarket. Analyzing location data from 50 million verified consumers, inMarket ranked grocery retailers based on average frequency of customer return visits per month for 2018. Fry’s, a Kroger Co. chain with 119 stores, had an average customer return trip frequency of 2.44 for the year, ahead of No. 2 Giant Eagle at 2.30. “Loyalty has often been a barometer of success for businesses. By using metrics like customer loyalty index, grocery stores can determine the health of their repeat shopper business,” inMarket said in its report, which evaluated grocery chains with at least 50 stores. The Kroger Co. had seven chains on the list, including three in the top five. Besides No. 1 Fry’s, they included Ralphs at No. 3 with a score of 2.26 (tied with Publix Super Markets) and Smith’s at No. 4 with an average frequency of 2.24. Other Kroger Co. banners making the list were Harris Teeter (No. 6 with a score of 2.20), Kroger (No. 7 at 2.17), Dillons (No. 17 at 1.72) and King Soopers (No. 18 at 1.70). Rounding out the top 10 chains in average frequency of customer return trips were H-E-B (No. 5 with a score of 2.23), Safeway (No. 8 at 2.12), Food Lion (No. 9 at 2.03) and Vons (No. 10 at 1.95). “Some grocery chains with heavy penetrations in urban areas tend to have higher loyalty metrics than their rural competitors. This could be because denser geographic areas incentivize more frequent trips,” inMarket noted in its analysis. Four Albertsons Cos. grocery banners were on the inMarket 2018 loyalty list. Along with Safeway and Vons, they included Albertsons (No. 12 with a score of 1.90) and Jewel-Osco (No. 23 with an average frequency of 1.57). Ahold Delhaize USA had three of its supermarket chains on the list: Food Lion, Stop & Shop (No. 11 at 1.91) and Giant Food Stores (No. 22 at 1.58). InMarket’s ranking also had three independent grocery chains with fewer than 100 stores: Schnuck Markets (No. 20 with an average return trip frequency of 1.61), Wegmans Food Markets (No. 21 at 1.60) and Big Y Foods (No. 24 at 1.55).